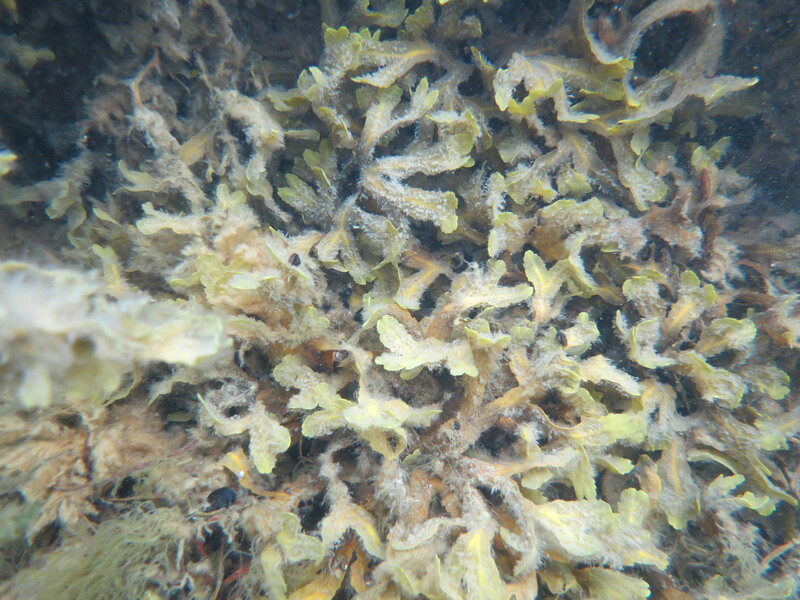 Fucus evanescens, is an introduced species to the Baltic Sea. That means that it did not enter the Baltic Sea by itself, but was brought here, possibly by humans. A piece of seaweed could easily have stuck to an anchor or similar. This is quite common nowadays, where boats unknowingly transport species in their ballast water from one place to another. Serrated wrack, Fucus serratus, is easily recognized by its serrated edges. In the Baltic Sea we can find serrated wrack along the Swedish coast up to the Gryt archipelago in Östergötland, where the salinity is approximately 7 psu. We have not found any observations of its distribution along any other Baltic countries coastlines. If you know of any such, please let us know. Serrated wrack is sensitive to dehydration and is not as tolerant as i.e. bladderwrack to air exposure. Where we find baldderwrack and serrated wrack living together, the serrated wrack is often found slightly deeper thatn the bladderwrack. Outside the east coasts of Öland and Gotland, for example, there are wonderful forrests of serrated wrack at about 8 m depth. Serrated wrack thrown ashore by waves often gets a more brown-orange colour before it dries and turns almost black. 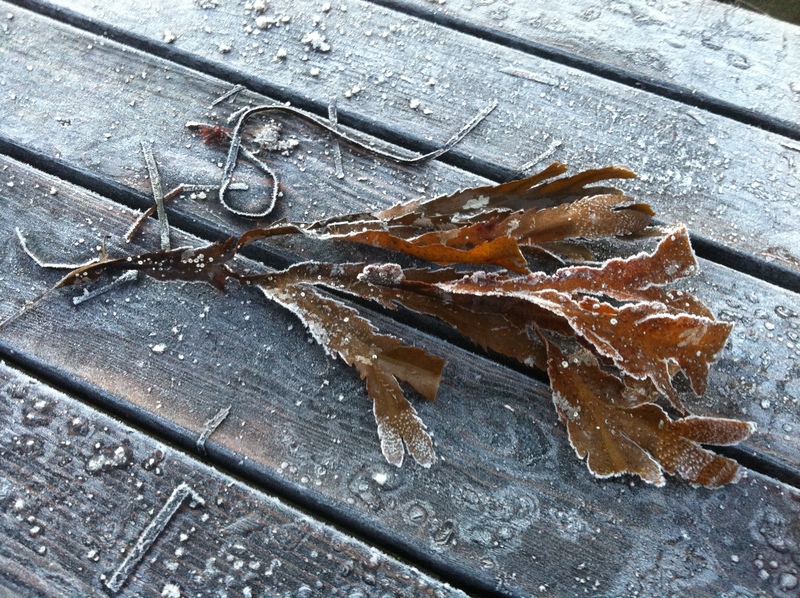 In the winter, you can find frost covered seaweed when you walk along the shore. The scientific name of narrow wrack is Fucus radicans which means that it belongs in the Fucus family, together with bladderwrack, serrated wrack and spiral wrack (Fucus spiralis). Narrow wrack is recently discovered, since it was long belived to be a dwarf morph of bladderwrack. 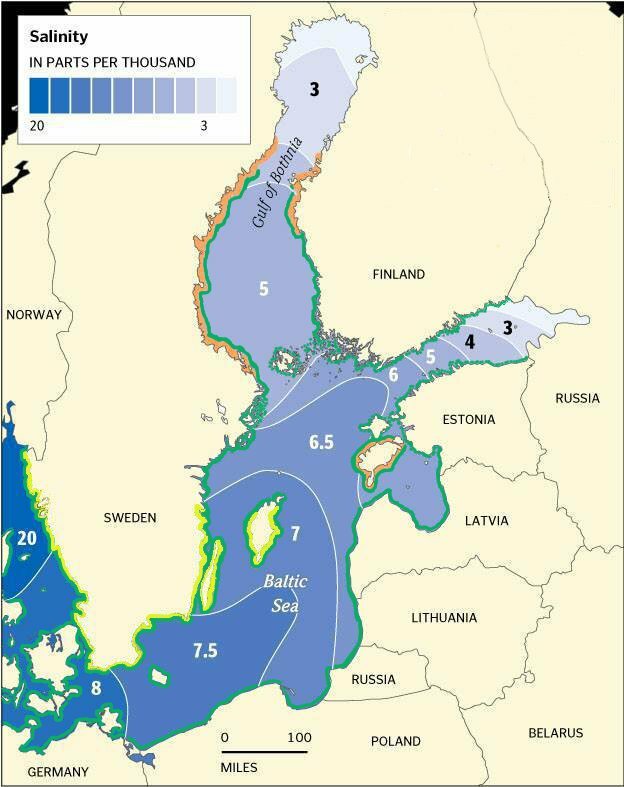 It is not unusual that organisms are smaller in the low salinities of the Baltic Sea. Using genetic tools, narrow wrack was identified as a new species in 2005. Since then, researchers at Stockholm and Gothenburg University have studied the ecology, reproduction and genetics of the narrow wrack. Narrow wrack is found along the Swedish coast from Öregrund to Umeå, from around Vaasa area down to Poori/Björneborg on the Finnish coast and around the Estonian island Ösel/Saaremaa (see map under The Baltic Sea fact). Narrow wrack has not been found outside the baltic Sea, as far as we know. Narrow wrack is clonal, wich means that it reproduces by fragmentation, but it also has sexual reproduction. The individuals that have formed by fragmentation, where small branches from the plant falls off, drift away and then reattach to a rock or boulder, all have the same genetic variation as their “mother” plant. There is one plant in particular that have been very successful along the Swedish coast, where almost 80% of all individuals are one clone. The most common wrack in the Baltic Sea is the bladderwrack, Fucus vesiculosus. Fucus is from the greek phykos, meaning seaweed. The species name vesiculosus refers to the gas filled bladders that are common in the species. It is belived thet the bladderwrack has been present in the Baltic Sea for about 8000 years, from the period known as the Yoldia Sea. Bladderwrack and serrated wrack (Fucus serratus) are both marine species that have, more or less, adapted to the brackish waters of the Baltic Sea. The best adapted species is bladderwrack, that we can find all along the Swedish coast almost as far north as Umeå. Bladderwrack can vary very much in shape and size, depending on whether it is living on rocks that are exposed to strong waves or living in sheltered bays. Where it is sheltered it can grow to over one metre in height, with broad thallus and plenty of bladders. In exposed sites, the bladderwrack often lacks bladders so that the waves cannot tear it away. Both height as well as thallus width is much less on exposed sites. Bladderwrack has the same lifecycle as humans. The plants are either male or female. They produce eggs and sperm in special organs, called receptacles. The receptacles are located in the tips, with a warty structure. Eggs and sperm are released into the water column on still nights around full moon. 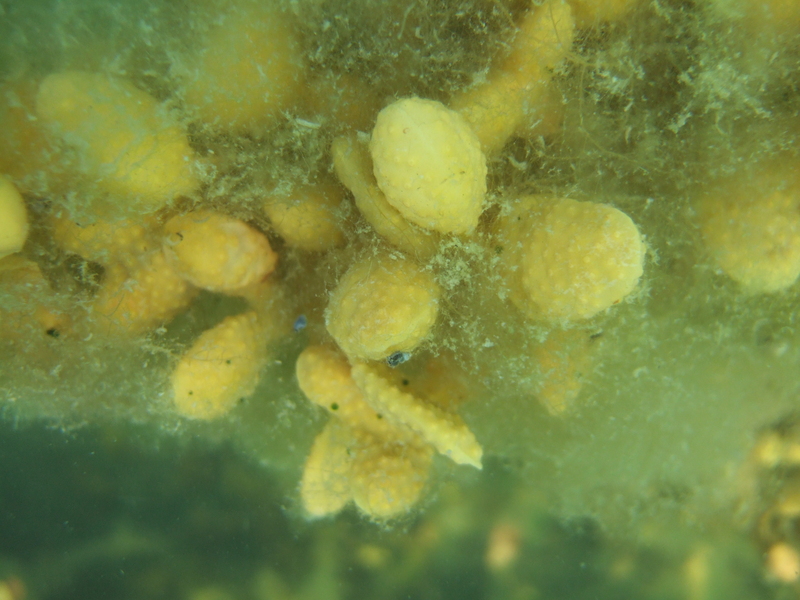 The negatively buoyant eggs sink to the sea floor, followed by actively swimming sperm. 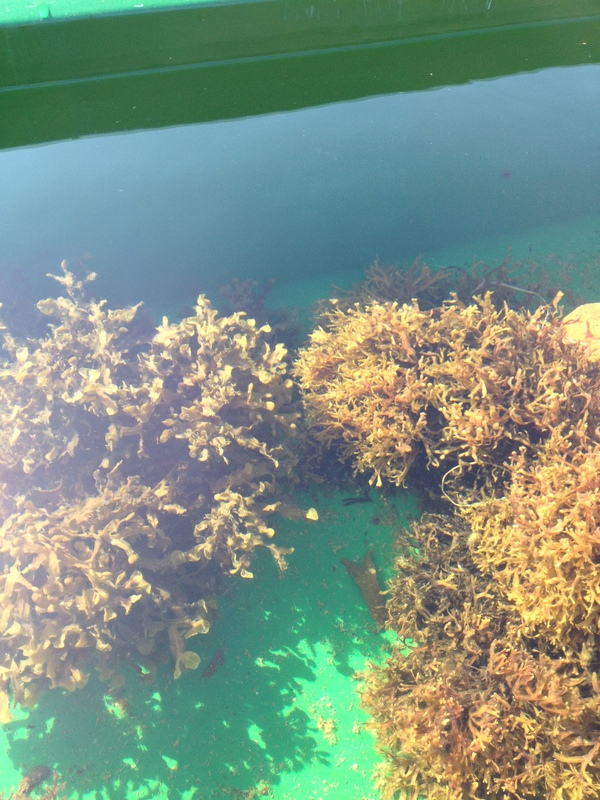 New seaweed is made.